Braces enable those with crooked, protruding or uneven teeth to straighten their teeth for a beautiful smile. If you have gaps between your teeth, braces can close these gaps. Besides an improved smile, straight teeth also mean that brushing and flossing is a breeze, resulting in healthier teeth and gums. You will be able to chew better and improve your facial profile. Braces are wire-based devices used help to correct crowded or misaligned teeth and/ or jaws. When one’s teeth and/ or jaws are straighten, one’s bite and facial profile can be improved. Treatment usually takes between 2 to 3 years, sometimes longer or shorter depending on the complexity. For most patients, the best time to start braces is after all their milk teeth have been replaced by permanent teeth. This is usually between the ages of 11 to 14 years old. Contrary to popular notion, adults can also reap the same benefits as teenagers from braces treatment. During the initial consultation, our dental specialist/ dentist will find out the details of your medical and dental history, discuss concerns you have with your teeth and advise the best form of orthodontic treatment to align them. Clinical records such as X-rays, impressions and photos of the teeth will be taken to help in an accurate diagnosis and planning of the treatment and type of braces for you. Subsequent appointments involve insertion and adjustment of the braces.Insertion may take between 1 to 3 visits to complete depending on the type of braces. After the braces are in the mouth, you will be reviewed and your braces adjusted every 4 to 8 weeks. You should avoid biting on large hard pieces of food (e.g. biting into an apple) to prevent dislodgement of your braces. Initially, there may be some discomfort and feeling of ‘tightness’. Your teeth feel sore because they are moving into alignment. After a few days, the discomfort should lessen. Occasionally, the inner side of your cheeks or lips may get an ulcer from rubbing against the braces. This can be quickly and easily relieved with the application of dental wax. Treatment with fixed braces usually takes between 2 to 3 years, although it may sometimes be adjusted shorter and longer depending on the complexity of the case. After your braces are removed, your dental specialist/ dentist will provide you with removable or fixed retainers. Retainers need to be used throughout your life. They are important as they hold your teeth in their corrected positions after the braces have been removed. You should see your dental specialist/ dentist about 1-3 months after your retainers are fitted. Subsequently, you can arrange for your visit to coincide with your routine 6-monthly dental check-up. Upon confirmation that you will proceed with your braces treatment, a 50% deposit is required. The remaining 50% of the balance can be made at subsequent review visits in instalments of SGD$200 each time. ^For lingual braces, first payment of $3,000 is collected when bond up is done; second payment of $2,500 is collected during the second appointment; and $300 will be collected during each review visit until the remaining treatment fees have been fully paid. Depending on the individual, there may be other treatment fees involved, for instance, extraction. A more detailed estimate of the fees involved can be confirmed after the initial consultation. Medisave does not apply to braces treatment. However, should you require wisdom teeth removal prior to braces treatment, Medisave may be utilized for the wisdom teeth surgery. For more details on Medisave coverage, please visit our Medisave Page. Specialist Dental Group’s Braces team comprises of Dr Eugene Chan, a dental specialist in orthodontics who received his specialty training in Australia and Dr May Ling Eide, a dental surgeon who received her postgraduate training in orthodontics in the United Kingdom. Each of them has undergone additional intensive training in the areas of teeth alignment. They have also spent many years doing these procedures on a regular basis and are very experienced with all aspects of orthodontic treatment. You can be assured that our dentists will be able to take care of your orthodontics needs, from simple to complex cases. We can usually schedule for you to see our specialists/ dental surgeons within 24 hours and depending on your dental condition, it may be possible for you to start braces treatment on the same day as your initial consultation. There are two main types of orthodontic treatments – fixed and removable appliances. Traditional metal braces comprise of brackets that are affixed to teeth and wires that are threaded through slots in the brackets. Some patients may also have metal bands encircling back teeth. Wires are held to brackets by tiny rubber bands. Brackets are generally made of stainless steel and the wires are made of metal alloys to deliver a constant, gentle force to move teeth. Although not the most aesthetic type of fixed braces treatment, metal braces are predictable, yield good results, and it is the least less costly option. We also provide colourful braces where you can choose the colour of the elastic ties that bind wires to the brackets. You can even change the colour each time you visit the dentist. We have patients who change the colours of their elastic ties according to the holiday season. For instance, opting for red and green ties during Christmas. Wearing metal braces can be fun! Ceramic braces are tooth-coloured. While not completely invisible, they are more subtle and less noticeable, making them the more aesthetic option. Did you know that Tom Cruise wore ceramic braces? If you were not aware of this, then it means that the ceramic braces did a good job of being unnoticeable on this much-photographed Hollywood personality. Similar to metal braces, ceramic braces are affixed to teeth, and wires are threaded through slots in the brackets. Wires are held to brackets by tiny rubber bands. The brackets are made of ceramic and the wires made of metal alloys to deliver a constant, gentle force to move teeth. Ceramic braces blend in with your teeth and are less noticeable from a distance or in photographs. On the other hand, the professional fees involved for ceramics braces are higher than traditional metal braces. The clear/white elastics also stain easily if not cared for properly. The good news is that since your elastics are changed regularly at your monthly orthodontic visits, the stained effect only lasts until your next dental appointment. Instead of using wires or elastic bands, self-ligating braces are designed with a tiny gate to hold on to the archwires gently. This means that treatment is more comfortable than metal and ceramic braces.The entire treatment also takes a shorter timeframe, roughly an average reduction of 4 months, to complete. The number of appointments to the dental specialist/ dentist is reduced by an average of 4 visits as compared with conventional metal or ceramic braces. In addition, oral hygiene is easier to achieve as self-ligating brackets do not accumulate plaque as much as rubber modules or wires. They do not easily stain since they do not contain rubber parts. They are also strong and rarely break. Lingual braces are placed on the back of your teeth (at the side of the tongue), hiding the appliance from your smile, making it unnoticeable to others. This is the main advantage of lingual braces and one of ways to straighten your teeth in an “invisible” manner. In terms of materials involved and techniques required, it is largely similar to conventional metal braces. In terms of comfort level, lingual braces generally require more time to get used to and wear. Invisalign® uses 3-D computer imaging technology to plan and map your complete orthodontic treatment. Your teeth are gradually moved into place by a series of customized clear aligners. The clear aligners are easy to insert and remove, making cleaning the aligners easier. Oral hygiene is also much easier as the clear aligners can be removed when brushing teeth. There is no need to deal with messy wires and brackets. Invisalign is like contact lens for your teeth. The aligners are not easily noticeable and cannot be seen in photographs or from afar, only subtly close up. However, Invisalign requires discipline – the aligners have to be worn for a minimal of 20 to 22 hours a day. For more information, please refer to the Invisalign page here. In order to know which orthodontic treatment is most suitable for you, consult one of our dental specialist/dentist and share with them your concerns (eg. aesthetic, comfort, affordability) so that they can advise accordingly. Is orthodontic treatment suitable for patients with diabetes, high blood pressure, heart problems or patients who are pregnant? 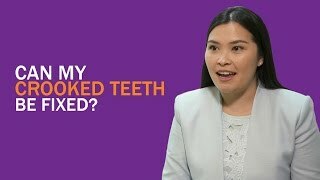 Does diet play a part in crooked teeth? What happens after the braces are removed/ after I complete my Invisalign treatment?